AltaLink Line Criticized Over Environmental Impacts | R.E.T.A. AltaLink’s environmental practices are being questioned once again, this time by a local High River biologist who recently discovered AltaLink was not following normally-accepted construction practices to minimize environmental damage (High River Times). 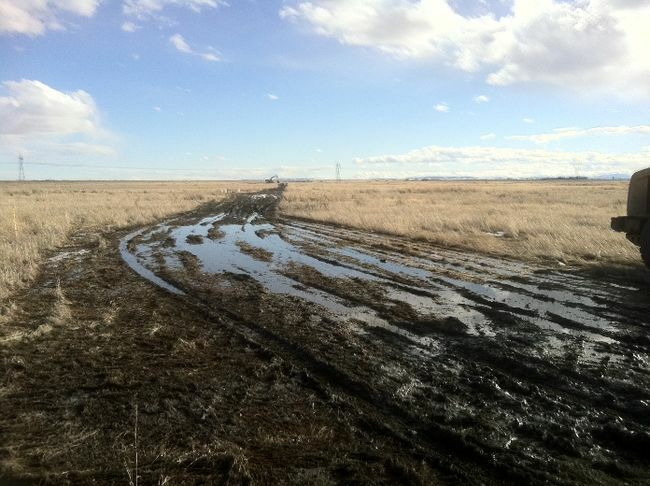 Greg Wagner, Principal and Senior Wildlife Biologist with Athene Environmental Ltd., discovered heavy track vehicles tearing up the ground along the alignment of AltaLink’s new high voltage transmission line near internationally-recognized Frank Lake. Wagner said, “They’ve gone in during wet conditions and tore the ground up, which is bad environmental practice and should be done under frozen or dry conditions…I’m sorry, but it’s not acceptable to do that in wildlife habitat. You’ve got agricultural land and places all over you could do this and get away with it…It’s ugly; it’s got to be reclaimed.” He said vegetation mats, designed to minimize damage to the ground, were not initially used during construction. Invasive plant species often establish themselves when the ground is rutted and tracked. The environmental damage was done when crews were anchoring new transmission towers. Frank Lake is an Important Bird Area (IBA), managed by Ducks Unlimited. IBAs are recognized as being globally important habitat for the conservation of bird populations. Just a few of the more interesting bird species found at Frank Lake include: trumpeter swan, tundra swan, short-eared owl, eared grebe, black-crowned night heron, marbled godwit and black-necked stilt. It is a well-known fact that overhead high voltage power lines have major adverse effects on bird populations, including killing birds through collision with conductors, shield wires and towers. About 174 million birds are killed annually in the U.S. alone, crashing into overhead power lines. Wagner said Frank Lake is a major staging area for trumpeter swans, a “Threatened” species in Alberta, and having birds fly into the wires remains a concern. “We know that these lines can be very hard on large birds with heavy wing loadings like swans, cranes, and Canada geese. They don’t have much manoeuvrability.” He continued, “Within the MD of Foothills, you only have one internationally significant wetland for birds and this is it, so why do you even have one new transmission line coming in?” An AltaLink communications manager said, construction begins when scheduling allows it, and “…we have time lines to meet when we’re building major transmission projects”. AltaLink has a history of being very cavalier about the impacts of their overhead transmission lines on the environment. Transmission companies in Alberta have not needed to conduct formal Environmental Impact Assessments (EIAs) of new high voltage power lines since 2008, when the Alberta Government exempted all high voltage lines from this requirement. Very limited environmental assessments are sometimes now conducted as part of transmission companies’ applications to the Alberta Utilities Commission (AUC), but these assessments do not meet the standards of EIAs. See this link (AltaLink’s Pincher Creek Line) and this link (AltaLink’s Heartland line) for other recent examples of AltaLink’s and the AUC’s poor environmental track records. More information on the environmental impacts of overhead high voltage transmission lines can be found at this link, this link and this link. ~ by RETA on April 19, 2014.